The Libertarian Party (Dutch: Libertarische Partij, LP) is a Dutch political party founded in 1993. She hopes to develop “a free world, a world in which no one is forced to sacrifice his or her life and property for the benefit of others”.Its founder is Toine Manders, who works for the Haags Juristen College. On 9 May 2015, Jasper de Groot was elected as chairmain. The party took part in the Dutch General Election of 1994, receiving 2,754 votes and no seats. After this, the party spent nearly two decades in ‘hibernation’, organizing lectures and events to spread its message, but not partaking in national elections. The party once again became active in 2012, and participated in the Dutch general election of 2012, receiving only 4,205 votes. Since then, the party has participated in 10 municipal elections in 2013 and 2014, has elected a new chairman, and is in the process of expanding and modernizing. Since 2012, membership has increased noticeably, though the party remains unrepresented in any representative or legislative body. In 2014, the Libertarian Party was the first political party in The Netherlands to accept Bitcoin. The party also participated in the Dutch Provincial Election and plans to participate in the next General Election. The party platform is based on Libertarian principles such as personal and economic liberty, respect for private property and self-ownership. 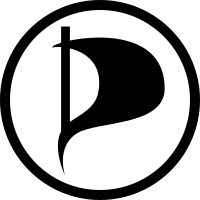 The Pirate Party (Dutch: Piratenpartij, PPNL) is a political party in the Netherlands, formed in 2006 but not officially registered until 10 March 2010.The party is based on the model of the Swedish Pirate Party. The party participated at the 2010 Dutch general elections. The party gained no seats in the House of Representatives, becoming the third highest-ranking party not to gain any seats in the election—with over 10,000 votes (0.1% of the national vote). The party is member of Pirate Parties International (PPI). International cooperation through the PPI is seen as crucial to realising the goals of the party. The positions of the party are based on the Pirate Party Declaration of Principles. Samir Allioui, co-founder of PPNL and party leader during the 2010 elections, was Co-President of Pirate Parties International (PPI) from July 2009 until April 2010. On July 12, 2012, the candidate list for the parliamentary elections was announced. The Party leader, Dirk Poot, who two years earlier was 4th place on the list is first on the list, with former leader, Samir Allioui, coming last on the list. The party achieved 0.3%, over 30,000 votes, almost tripling their vote from the last election but failing to meet their target of entering parliament. They also became the largest party not to be represented in parliament. In none of them was it able to win a seat, but on March 21 it was announced that the party won a seat in the Amsterdam West District Committee. GeenPeil is a political initiative by GeenStijl, a Dutch weblog and political party known for its provocative content and its past hoaxes. The name refers to polling results. GeenStijl organized its first GeenPeil initiative during the 2014 European Parliament elections which were held 22 thru 25 May 2014 within the European Union. Being among the first to vote on May 22, Dutch municipalities were not allowed to publish the results of the election before those of the other EU members were known. Because the Dutch Electoral Act states that the chairman of every polling station has to read the electoral results out loud, if requested to do so, GeenStijl found 1,442 volunteers willing to register and call-in the results of nearly every polling station within the country. Based on those results, GeenStijl was able to construct and publish its own exit poll in the early morning of 23 May 2014, several days before the last election results became public. GeenPeil gained further publicity in 2015 by calling for an advisory referendum on the Ukraine–European Union Association Agreement. The call for this referendum was supported by several Dutch political parties, including the PVV, Groep Bontes/Van Klaveren, SP, 50PLUS and PvdD. Opposing voices to the referendum stated that the subject was unsuitable for a ‘substantive public discussion’; former minister of Economic Affairs Laurens Jan Brinkhorst said that in reality the referendum is not about the association agreement, but really is a “defining tool for either opposing or siding with Putin‘. On 29 October 2015, the Dutch Electoral Council announced all legal stipulations had been met and the referendum would be held on 6 April 2016. This latest GeenPeil campaign was headed by GeenStijl reporter Jan Roos, who later announced GeenPeil will not engage in any political campaigns aimed against or for the Ukraine agreement. Instead, priority will be given to the minimum participation quorum of 30%, as stipulated in the Dutch Advisory Referendum act. If the quorum is not met, the referendum will be ruled invalid. The Dutch Ministry of Internal Affairs decided on establishing a budget of 20 million euros to finance the GeenPeil referendum, less than half the amount reserved for the 2012 national Parliamentary elections. According to the Association of Netherlands Municipalities VNG, this budget would have a negative effect on the democratic electoral process. In an effort to increase the financial means for municipalities as well as safeguard the democratic process, on 3 December 2015 a motion was put forward by D66-politician Fatma Koşer Kaya and SP-politician Ronald van Raak to increase the budget to 42 million euros. The motion was opposed by majority – consisting of VVD, PvdA, CDA, SGP and CU – and therefor not adopted. The GeenPeil campaign team considered the failed motion to be ‘the last straw’ in a series of incidents and decided to invoke the aid of the Office for Democratic Institutions and Human Rights (ODIHR), the principal institution of the OSCE that same day. A letter from GeenPeil, sent to the ODIHR office in Warsaw, formally requested an ‘ODIHR Election Observation Mission’ to be sent to the Netherlands as soon as possible, not only to supervise the referendum itself on 6 April 2016, but also to analyze the perceived ‘political obstruction’ which GeenPeil felt was intended to cause the referendum to fail. The GeenPeil campaign set out to investigate whether the reduced budget would influence the number of polling stations each municipality would open for the GeenPeil referendum. On 13 December 2015, over 40 municipalities (out of a total of 396) indicated they were planning to tentatively or definitely reduce the number of polling stations. Although in some cases the reduction only concerns one polling station, in other cases over 50% of the standard polling stations for elections are to remain closed for this referendum. Multiple reasons – including a lower budget – were given for the decisions. On 15 December 2015, the municipality Oldenzaal based the decision to reduce the standard 17 polling stations with 70% to just 5 stations on ‘budgetary reasons’. Shortly after these results were made public, several municipalities – pressured by either local council members or the public – reverted to the standard number of polling stations. By mid December, only 5 out of the total of 396 municipalities had not answered the questions regarding the number of polling stations, posted by GeenPeil in early November. Despite continued efforts, these municipalities – Alphen-Chaam, Kerkrade, Sint Anthonis and Sittard-Geleen – refused to communicate their intentions. On 25 November 2015, a majority of the House of Representatives stated they would respect the results of the advisory GeenPeil referendum, even though most parties preferred the Ukraine Association Agreement to be ratified. Less than a month later, however, on 15 December 2015, a motion proposed by House of Representatives member Louis Bontes to respect the results of the GeenPeil referendum was voted down. GeenPeil supported the Brexit-campaign of UKIP. Jan Roos was present with UKIP leader Nigel Farage at the so-called “Battle of the Thames”, a maritime confrontation on the Thames between Leave and Remain supporters prior to the Brexit-referendum. GeenPeil later became a political party and intends to take part in the Dutch general elections on 15 March 2017. The lijsttrekker is Jan Dijkgraaf. Group Bontes/Van Klaveren (Dutch: Groep Bontes/Van Klaveren) – For the Netherlands (Dutch: VoorNederland – VNL) is a parliamentary group in the House of Representatives of the Netherlands formed on 15 April 2014 by Louis Bontes and Joram van Klaveren, two Members of the House of Representatives of the Netherlands had left the Party for Freedom (PVV).On 28 May 2014 Louis Bontes, Joram van Klaveren and Johan Driessen announced the formation of a new political party. On May 28, 2014, the group officially founded a new political party, VoorNederland (VNL) (in English For the Netherlands or Pro-Netherlands), a classical liberal and Liberal conservatism and Eurosceptic political party. On 13 November 2014, the party announced that it would cooperate with the UK Independence Party in the Alliance for Direct Democracy in Europe. In December 2014 and January 2015, VNL was joined by former PVV leader in the European Parliament Laurence Stassen and, leading up to the 2015 provincial elections, two provincial PVV representatives from Groningen and Gelderland. On 27 January 2015 it was announced that the members of the party Article 50 had voted to merge it into VoorNederland. On 21 April 2015 it was announced that jurist and former lawyer Bram Moszkowicz would become the party leader and lijsttrekker of VoorNederland at the next Dutch general election, planned for 2017, but after nine months he was rejected by the party. VNL is a proponent of small government and supports the introduction of a low flat tax rate. Furthermore, it supports investment in the police and defence, seeks to limit the powers of the European Union to a free trade area, and wants a stricter immigration policy. The 50PLUS (Dutch: 50Plus, 50+) is a pensioners’ interests political party in the Netherlands. The party was founded in 2009 by Maurice Koopman, Alexander Münninghoff, and Jan Nagel, a politician formerly connected to the Labour Party and Livable Netherlands. Henk Krol is the Leader since 2016. The party first participated in elections during the Dutch provincial elections of 2011. During these elections the party obtained 9 seats in the States-Provincial. In the Dutch Senate election of 2011 the members of the States-Provincial elected the members of the new Senate. During these elections, the party won one seat in the Senate. During the Dutch general election of 2012 the party obtained 2 seats.